Proper management of the nitrogen and carbon cycles is crucial in order to achieve regulatory compliance with out wasting resources and energy. The Oxysmart provides a high performance solution, even for smaller plants where large staff or integrated controls systems may not be present. Oxysmart is a control algorithm. It’s based on a proven theory that is possible, in a municipal treatment plant, to control the activated sludge treatment process by monitoring the concentration of ammonium. Loaded on a 50-series Controller, this algorithm transforms the control unit into a system capable of managing compressors, VFDs and mixers, to optimize the process and adapt to load variations. The Oxysmart 50-series is installed at the basin and its operational from the moment of installation. The logic is adaptable to any plant, regardless of the electro-mechanical equipment, to optimize the operation. 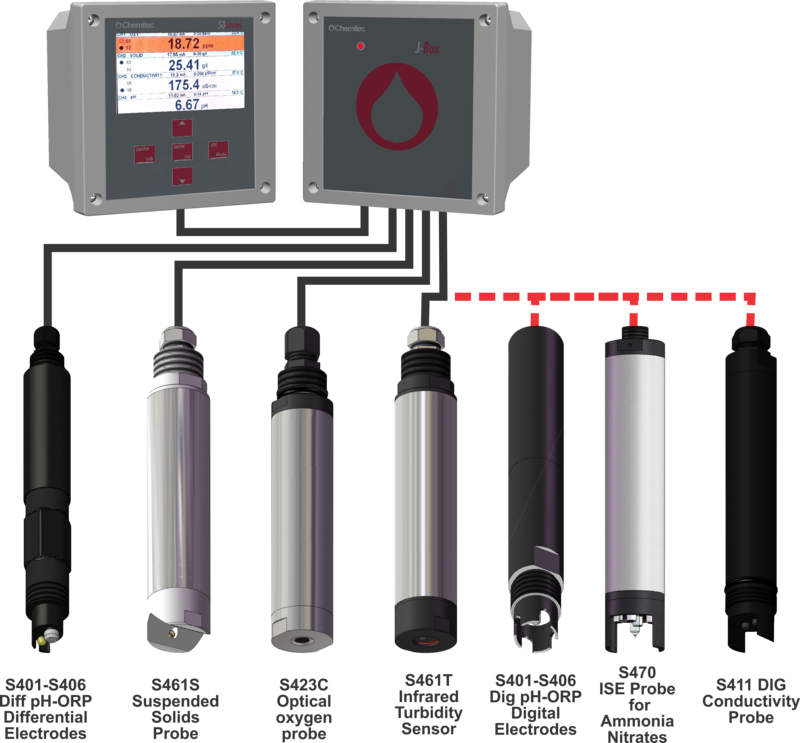 The Oxysmart works by continuously adjusting the oxygen set point based on the load and reduction. Of ammonium as detected by the Included ammonium-ion selective S470/NH4 probe. A Chemitec optical D.O. Probe (also included) monitors the achievement of the target O2 level. Low load conditions the DO threshold is maintained at low levels. It then grows as the load increases. In conditions of low load, the system enters pause/work mode, ready to modulate the oxygen when the load increases. The end of an aeration cycle, the system activates the mixer, turns off the compressors and waits for. A peak of ammonia nitrogen; when the peak is reached, the Oxysmart reactivates aeration. Oxysmart provides a range of security to protect the compressors and drives, as well as compensate for probe failure. Economical: High tech at a low price. Reduce costs of ammonia-nitrogen intervention. Simple: Easy to install, immediately operational, and low maintenance. Advanced Control: optimization of energy consumption, effluent stabilized for compliant ammonia nitrogen levels.